As new products enter the market, it creates an even greater landscape for the angler to navigate to the right kit which completely satisfies their requirements. Confusion, indecision and 'analysis paralysis' are commonplace during this process. However the road gets so much easier when you know a product has been tried and tested by a 'trusted authority,' and there's no better authority than Trout Fisherman Magazine. Robbie Winram, Trout Fisherman's independent fishing tackle tester has tested 1000's of items throughout his 30 year flyfishing career, and as a consequence of his honest reviews, has taken the pain out of choosing the right gear. This month, Robbie tested our very own Stillwater Carron Deluxe Boat Bag and our exclusive range of Guideline Reach Fly Rods, both of which achieved unsurprisingly high praise. "This bag offers plenty of storage options and won't bust the budget." "I think it would also suit the bank angler." "Inside is a spacious main cargo compartment measuring 19x10x8.5 inches that can be subdivided with 5 removable dividers." 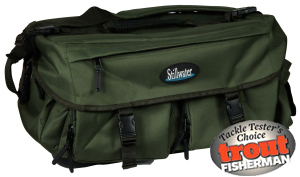 "This bag functions very well and does its job, all at an excellent price." Glasgow Angling Centre recently hooked up with tackle manufacturer Guideline to produce an exclusive range of fly rods. We knew at the time they would be a massive hit, but it's nice to have that belief upheld. "These are superb value rods at under £100, but don't make the mistake of thinking the price tag makes them suitable for only beginners. Even experienced anglers will enjoy the feel and merits of this range." "These rods are reasonably light compared to other similarly priced rods, but the finish is of a very high standard." Essentially, quality does't necessarily mean spending a fortune! These two products are proof that you can actually get the performance benefits of higher end fishing tackle, but at a fraction of the cost. But don't let the accolades convince you. You'll want to buy this stuff to find out for yourself.